If you are running a quotation based job, this quotation request form PDF template will highly ease your process of gathering information from your customers and giving accurate quotations. Its nicely designed quotation request PDF template is similar to a pre-purchase invoice which specifies the price and quantity of the quoted items with the information of the customer. 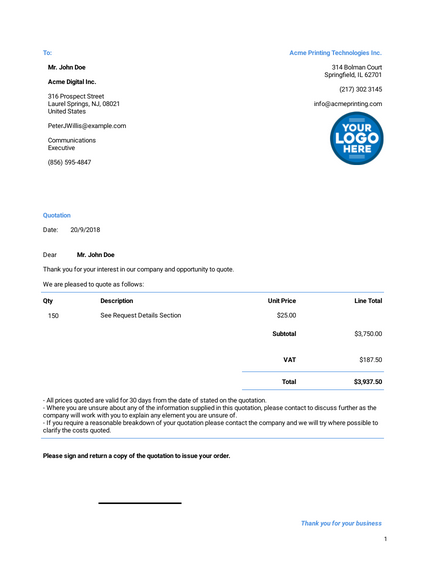 This fully customizable Quotation Request Form will help you to gather company and contact information of the customer. Along with this information, every detail that can be considered during giving an accurate quotation is asked in this form. If you have any additional details that you would like to consider while giving a quotation, feel free to add that into this Quotation Request form. - All prices quoted are valid for 30 days from the date of stated on the quotation. - Where you are unsure about any of the information supplied in this quotation, please contact to discuss further as the company will work with you to explain any element you are unsure of. - If you require a reasonable breakdown of your quotation please contact the company and we will try where possible to clarify the costs quoted. Please sign and return a copy of the quotation to issue your order. Fusce posuere felis sed lacus. If you are a photographer, designing an invoice for a photography session may be a tedious task. JotForm's new PDF editor will help you to make this task easier! You can create invoices easily by using JotForm's PDF editor.